And yet, I’m still surprised at how quickly things have changed. 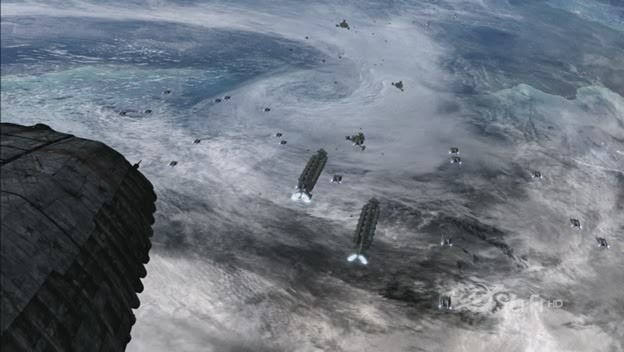 During the New Caprica and Algae Planet arcs, there was still the expectation that the fleet would return to space eventually, but here, I love the air of unpredictability around that final sequence. I love that in the span of one episode, we get about a million major revelations that let you know that BSG ain’t playing around anymore. The highlight is the scene between Adama and Tigh, two old friends who believed they knew each other, who are now divided by the question of identity. The reveal that he’s a Cylon is a huge, huge moment for a character like Tigh, and Hogan and Olmos continue their streaks of brilliance as everything comes crashing down around them. We’ve seen Adama overcome with grief before, but his collapse onto the floor in front of Lee is something we don’t expect from someone like him. And of course, it all leads up to the Earth reveal. This actually could work as a series finale, but placing the big Earth moment halfway through the season makes room for a plethora of interesting new questions. I’m not sure if the Cylon-human truce will last, but regardless, them putting aside their differences to find a new home is a major move on the part of the writers. I like it. “FRAK EARTH” says the wall. This is far from the happiest episode this show has produced, and although it’s a bit clunky in its execution–particularly concerning the Lee-Dualla scenes early on–it still features some truly devastating storylines. It’s an hour about what happens when what sliver of hope you had left vanishes just like that, about how various characters in the fleet react to the sorry state that Earth is in. It’s also another showcase for the cast and a goodbye to one of its supporting characters: Dualla, who puts a bullet in her head after capturing one last happy moment with Lee beforehand. It’s a shocking moment in and of itself, but when we take a look at the larger context, the motivation behind her decision begins to take shape. And even though Adama and Roslin don’t wind up killing themselves, we can see the lack of hope in their eyes; even D’Anna seems resigned to her fate and tells Tigh that she’s staying on Earth. It’s not the most ideal situation for any of them, and what makes it even worse is the revelation that all the remains on Earth are from Cylons. “All this has happened before and will happen again” is a major idea driving the show, and it once again moves to the forefront here. This one is a breather after several hard-hitting episodes, and it isn’t quite as compelling as the previous two. For example, I understand the idea of conveying Tyrol feeling like he’s losing his connections to the human race, but I just feel like there’s a better way to do so than throwing in the Hot Dog/Cally twist. Nevertheless, there are still some strong scenes throughout the hour, and although the episode’s pacing is pretty slow, it still sets up the Zarek-Gaeta mutiny well; I’m interested to see where that goes. And with Adama and Roslin, the show’s exploring what happens when the two leaders of the fleet decide to shift from a more big picture perspective to a personal perspective. It nicely sets the stage for someone like Zarek throwing his hat into the ring. I’ve been really wanting to watch this show? What program does it air on? It was on Syfy, but it’s over now. Not sure if they’re showing reruns or not. I’m just going through it on DVD.